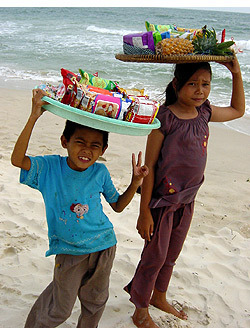 Cambodia: Headed for a Better Future? 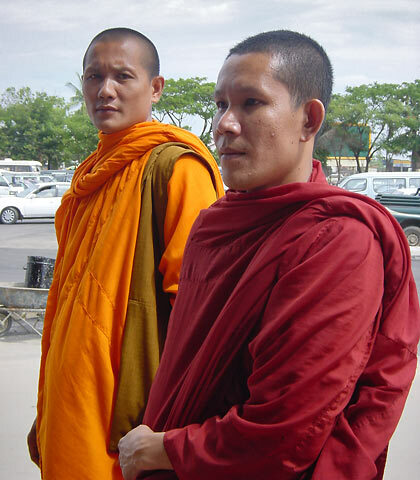 When we arrived in Phnom Penh in 1998 for a 2-month long project, Cambodia was still recovering from a recent coup d'état, a lengthy civil war and the genocidal reign of the Khmer Rouge. Different parts of the country still exhibited the ravages of war, many major highways were unpaved and had yet to be cleared of landmines and the psyche of the population unmistakably bore the damaging effects of the Khmer Rouge’s brutal rule. In fact the Khmer Rouge was still very much in existence although confined to a small enclave in the north. And yet there were hopeful signs that pointed to a better future. In that same year, it seemed that peace had finally arrived, after decades of tumult, to this war-torn country. There were still a few local disturbances in 1998 such as police firing at demonstrators in Phnom Penh - and on the street just outside our apartment - but that peace has generally held up to the present. In 1998 too, Pol Pot passed away and within a short time the Khmer Rouge had effectively ceased to exist. Now the economy is growing quite well, the major highways are paved and tourists are swelling in numbers each year, many of them headed for Siem Reap and the fabled Angkor Wat. It appears that much has changed since our first visit to Cambodia. 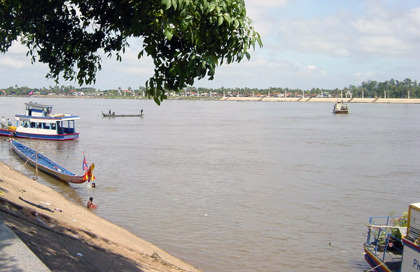 The Mekong River, Phnom Penh, Cambodia. How was Cambodia when we first set foot upon it more than 10 years ago? It was really like a country in the crossroads, somewhat unsure of itself and groping for form, but one which was also proud of its heritage, namely the Khmer Empire, the largest ever in Southeast Asia. There were many visible signs of the former spread all over the country and not just the Angkorian temples near Siem Reap and the Tonle Sap (the huge lake fed by the Mekong River). 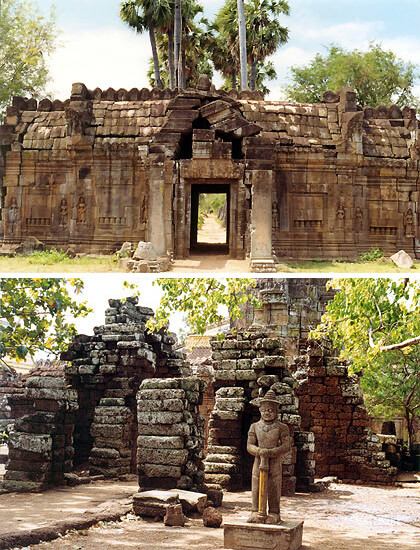 Khmer temple ruins such as the Wat Nokor in Kompong Cham dot the landscape. 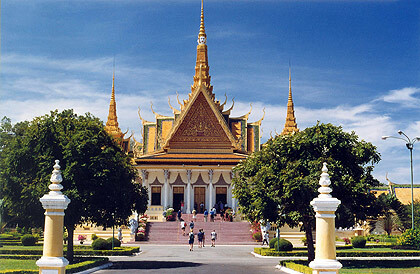 Angkorian architecture and art were very much in vogue (as they are even at present). Cities once emptied by the Khmer Rouge were slowly springing back to life including Phnom Penh and the port city of Sihanoukville. There were also sad reminders of the not-so-distant past, the killing fields at Choeung Ek and Security Prison 21, now the Tuol Sleng Genocide Museum. The 11th Century Wat Nokor ruins in Kompong Cham, Cambodia. And then its people… Almost any Cambodian we met at least had a relative who was killed or who simply disappeared during the reign of the Khmer Rouge. Many of them narrated tales of how they survived during the period, stories that made us thankful we did not have to go through the same ordeal. We often sensed the deep psychological scars inflicted on Kampuchean friends. Many times we noticed a lack of trust with each other – perhaps fueled by a Khmer Rouge policy of getting children to spy on their parents and punishing the latter in front of their very eyes on some vague “anti-revolutionary” offense. Corruption was pretty rampant. But we also sensed a lot of hope. There was an openness to the world not easily found in other Asian countries – there were such a high proportion of English speakers for instance. People felt comfortable relating to foreigners and were generally friendly. Years of hardship had also developed a certain toughness and persistence among the population. 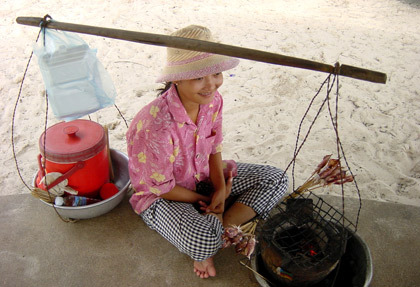 Woman selling grilled squid at a beach in Sihanoukville, Cambodia. Today almost three-quarters of Cambodians do not have any memories about the Khmer Rouge years. Much of Cambodia’s population is young, born during the years after the group’s fall from power – a comforting thought that at least they will not have to share nightmarish dreams of their country’s dark past. For the rest, it’s a challenge to continue to work towards a future bearing the lessons of the past.